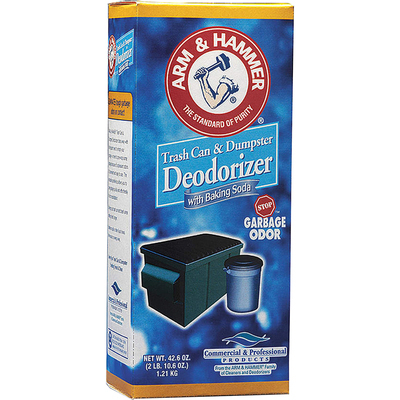 Deodorizer Helps To Eliminate Tough Garbage Odors On Contact - Not Just Cover Them Up. It Destroys Tough Odors On Contact With The Power Of Arm And Hammer Baking Soda And A Unique Odor-Fighting Fragrance. Use On Trash Cans, Dumpsters, Drains/Grease Traps, Diaper Pails And Any Other Trash-Containing Receptacle. Unscented Mixture Is Ready To Use..
Deodorizer Helps To Eliminate Tough Garbage Odors On Contact - Not Just Cover Them Up. It Destroys Tough Odors On Contact With The Power Of Arm And Hammer Baking Soda And A Unique Odor-Fighting Fragrance. Use On Trash Cans, Dumpsters, Drains/Grease Traps, Diaper Pails And Any Other Trash-Containing Receptacle. Unscented Mixture Is Ready To Use.